Anglesey celebrates the 250th anniversary of Thomas Telford in July 2007. Due to his great civil engineering achievements in Britain during the late 18th and early 19th century, Telford is often referred to as "The Colossus of Roads". Born in 1757 into a poor farming family in Langholm, Scotland, Telford left school at 14 to be a stonemason and learned his skills quickly. Examples of his early work can be seen near his home town, including a bridge, still standing today. After moving to London, he rubbed shoulders with influential architectural figures like William Chambers and Robert Adam. Early in his career he moved to Shropshire and some of his engineering projects included renovating Shrewsbury Castle and a major iron bridge crossing the Severn at Bridgnorth. Thomas Telford was responsible for a major canal building project,linking up North Shropshire with Wrexham, the industrial town in North East Wales, and also through to Chester and the Mersey, via Ellesmere. For local people here on Anglesey though, Telford will always be associated with the London to Holyhead A5 trunk road. If you travel along this road, through the mountains of North Wales, you will enter Betws-y-Coed. The impressive ironbridge which crosses the Conwy River in this small town, just before the Shell garage, was built by Telford. 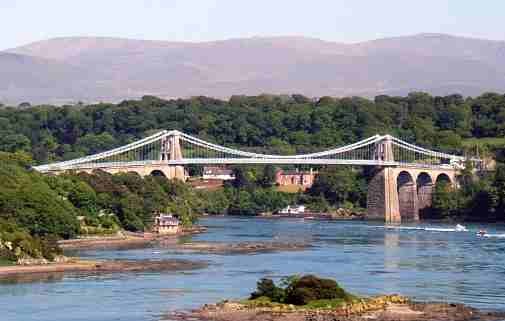 And here on Anglesey we have the landmark Menai Suspension Bridge, linking the mainland by road with the island. This bridge, started in 1819, took 6 years to complete, and had a significant impact on improving transport links across to Ireland via the port of Holyhead. Thomas Telford's other major construction across Anglesey, apart from the A5 itself, can be seen just outside Holyhead, where the Stanley Embankment (or "Cob") links up Anglesey with the smaller Holy Island in the West. Along the A5 road you will see the occassional toll-house or turnpike. At these locations tolls were collected from passing traffic, the funds being used to cover road maintenance. One such toll-house can be seen at the beginning of Telford's Stanley Embankment, on the Holyhead side, near Penrhos Country Park. Another example is next to the original building which housed the first Women's Institute in Britain, in the village of Llanfairpwll. Celebrations in Holyhead will remember the life of this great engineer. On 30 July these will include an event at the town Cenotaph, near the site where the coach and horses finished their journey from London. A replica stagecoach will travel from Stanley Embankment along the A5 to the "Coach Inn" near the Holyhead Cenotaph. Other Thomas Telford celebrations are planned across Anglesey including at Menai Bridge, and other parts of Wales.